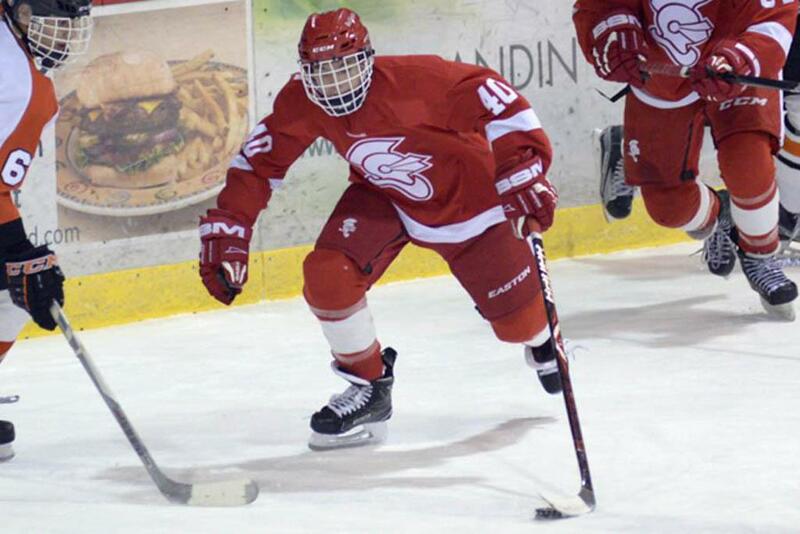 Pioneers' three-goal third closes out Red Knights. MAPLEWOOD, Minn. -- Hill-Murray used a three-goal third-period to close out a 5-1 win over Benilde-St. Margaret's in junior varsity action. The Pioneers scored twice in the opening period, getting a power-play goal with two minutes, 21 seconds remaining to give them momentum heading into the first intermission. However, neither team could find the back of the net in the middle stanza as the two teams headed into the third period with the hosts holding onto a two-goal lead. A pair of goals 77 seconds apart to start the third period helped Hill-Murray put the game out of reach but Sam Ryan ended their bid for a shutout when he scored with 3:30 play in the game. Jack Olson stopped 25 shots for the Red Knights as the Pioneers had a 30-18 advantage in shots on goal. BSM returns to Metro West Conference play when it hosts Chanhassen, Tuesday, at 5 p.m.
Sam Ryan's goal with 3:30 to play prevented Hill-Murray from registering a shutout.